Wildlife Research and Management was commissioned by BHP Billiton Iron Ore to shift a population of rock-wallabies occupying a small remnant of natural habitat contained within their mining operation on Mount Whaleback, near the Pilbara town of Newman. This population was threatened by the ongoing expansion of the pit at Mount Whaleback. 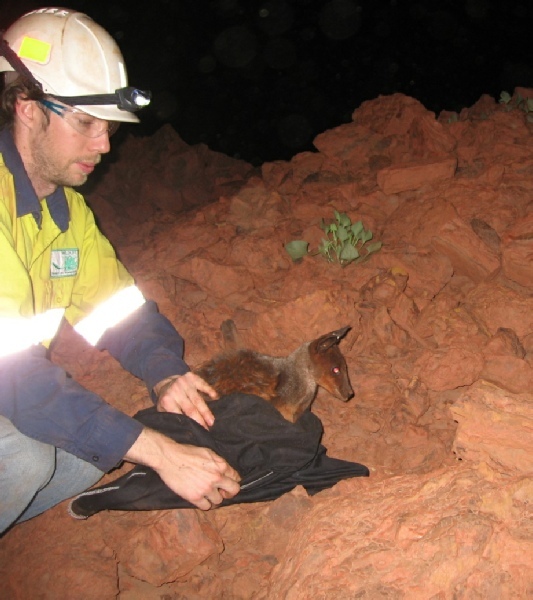 The brief involved survey of the rock-wallaby population on the mine site to establish the scale of the move required, locating suitable habitat for translocation, liaising with authorities, moving animals, and monitoring the outcome. Fifty rock-wallabies were translocated successfully to 15 sites within a 120 kilometre radius of Newman. Eleven animals were radio-collared to assess survival and movement. While some animals appeared to move rapidly away from their release location, others stayed within the immediate area. Survival for up to 9 months (the end of the monitoring period) was recorded. Client: BHP Billiton Iron Ore.
Wildlife Research & Management’s Andrew Hide releasing a rock-wallaby near Newman in the Pilbara.